The ViewSonic XG2760 focuses on providing smooth and responsive visuals via its 165Hz TN panel and G-Sync which we’ve seen in fantastic products like the Asus PG278QR. Nowadays, most are looking to IPS and VA variants for better vibrancy, but TNs are still the undisputed kings of speed and affordability. The ViewSonic XG2760 promises to offer superb performance at a projected lower price than its competitors, but can it match the PG278QR? 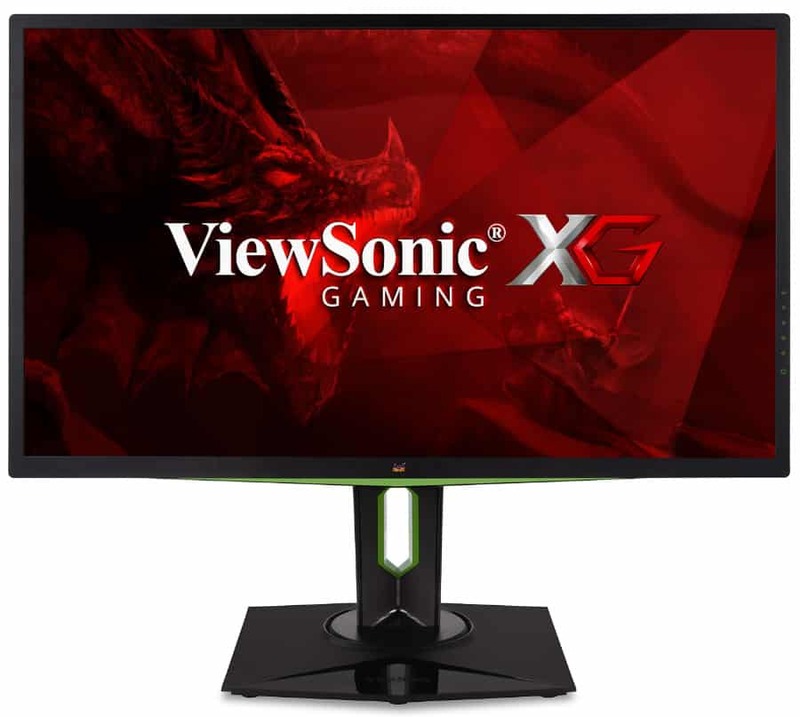 The ViewSonic XG2760 adopts the XG line’s latest aesthetic formula that features a simple design overall with slight hints of gamer-centric decorations. The monitor doesn’t steer too far from the XG2703-GS since both use green accents to denote the monitor’s Nvidia G-Sync feature proudly. The monitor isn’t bezel-free, but the matte black plastic frames should be unnoticeable to most since the screen is larger than the average. The monitor is predominantly textured in matte, but there are mixes of glossy details on the stand and base. The most significant change we noticed on the ViewSonic XG2760 is the use of a turntable design on top of the plate instead of hidden underneath. This update should improve the smoothness of trying to turn the screen to the left and right. On the rear, the ViewSonic XG2760 includes the X-shaped chassis panel we saw on models like the XG2530. We like that it isn’t overly aggressive, but some users who do not place their rigs against walls might want something that is more striking. Another feature you will find on this side is the six buttons which sadly, is missing a joystick for easy navigation. 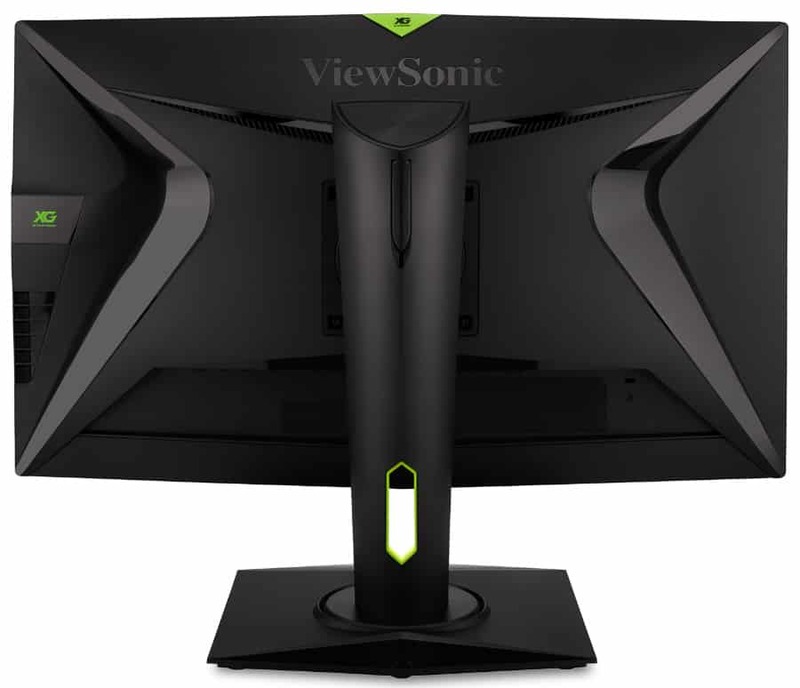 The stand on the ViewSonic XG2760 is just as flexible as the rest because it offers height, tilt, swivel, and pivot for ergonomics. It’s also removable via a quick detach buttons in case the user favors a VESA mount, although we don’t think that it is necessary. There is also a pair of built-in speakers at the rear, but we aren’t expecting explosive audio from them. The ViewSonic XG2760 is a G-Sync monitor, but itsI/O panel isn’t as limited as most would expect. The G-Sync module still restricts video inputs to DisplayPort 1.2 and HDMI 1.4, but there are more USB slots on this model when compared to competitors. Owners get to utilize three USB 3.0 slots (one for upstream) and another two with 2.0 standards. The ViewSonic XG2760 sports a 27-inch TN panel with a 2560 x 1440 QHD resolution, a 165Hz refresh rate, and 1ms response time. A contrast ratio of 1000:1 is specified, along with a WLED backlight that can go up to 350cd/m2. It’s also worth noting that this model will ship with a 3H anti-glare coating similar to what we see on Dell and Asus gaming monitors. We can expect fair to excellent results when it comes to color accuracy and gamut coverage if the ViewSonic XG2760 is using an ideal variant of the TN panel on the PG278QR. Granted, the limitations are still there, but the latest TNs have peaked to the point that they are already comparable to some IPS models. Of course, you have to factor in the cheaper price tag and the low risk of backlight bleeding. There are a lot of extra features on the ViewSonic XG2760 which we are looking forward to testing. The monitor is G-Sync compatible so Nvidia users, who make up most of the market now, can enjoy tear-free visuals without additional input lag. This monitor will only utilize the original version of G-Sync since it isn’t an HDR-compatible display. For the serious FPS gamer, you can turn off G-Sync and opt for backlight strobing or Nvidia’s ULMB (Ultra Low Motion Blur). Modern TN monitors are fast enough when it comes to pixel response times, and we have yet to see a new model that suffers from image retention or ghosting. There is also a five-stage Overdrive function that goes hand in hand with ULMB to give gamers the blur-free visuals they want for games like CSGO. ViewSonic’s signature features are also present, such as Black Stabilization and a five-option filter selector called GameMode. The most notable of the presets is the ColorX setting which optimizes the refresh rate, response time, and color for FPS titles. Frankly, we found little use for these extras since the brand’s monitors have been brilliant so far. The ViewSonic XG2760 is an exciting entry into the high-end display market that’s rapidly filling up with IPS and VA models. We can’t say for sure how this model can compete with regards to color performance, but we’re sure it will be a hell of a lot faster than the other panel types. We also love the brand since it brings products with fantastic value-per-dollar performances, and we are expecting nothing less from this new model.